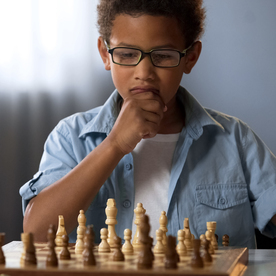 When: Feb. 25 through April 8 (no club on March 25 or April 1); Mondays, 3:30-4:30 p.m.
Learning chess helps kids build critical thinking skills, self confidence, the ability to analyze challenges in advance and stay focused under pressure. Check Mates Chess Club is open to all students from the community – both beginners and those who have played before. We'll focus on the joy of the game, sportsmanship and respect for others' abilities without judgment. Topics for beginners: fundamentals, basic moves and tactics. For intermediate/advanced players: algebraic notation (method of recording games), opening moves, middle game, and end game strategies.